Health is our most valuable asset and everyone deserves healthy feet! Receive a 10% discount towards your next purchase of UV Pro Elite. Please share this coupon with your friends and family. The UV Pro Elite is a one of a kind sanitizer that utilizes wireless, portable, compact and rechargeable UltraViolet (UV) light technology to combat bacteria and fungus that may cause a foul, unpleasant odor in your shoes, car, home, clothing and other possessions. You can use this compact device to clean your shoes, bags, gloves and any other household items. This product is different from other UV sanitizers because it’s wireless and rechargeable as well as it features a UV-C lamp that produces ozone, which helps to completely disinfect areas where the UV light cannot reach. The UV Pro Elite Two Units gives you twice the protection and versatility so you can simultaneously sanitize items more efficiently. The UV Pro Elite is a one of a kind sanitizer that utilizes wireless and rechargeable UltraViolet (UV) light technology to combat bacteria and fungus that may cause a foul, unpleasant odor in your car, home, clothing and other possessions. This product is different from other UV sanitizers because it’s wireless and rechargeable as well as it features a UV-C lamp that produces ozone, which helps to completely disinfect areas where the UV light cannot reach. The UV Pro Elite Set is the ultimate, professional quality sanitation system for doctors and families. 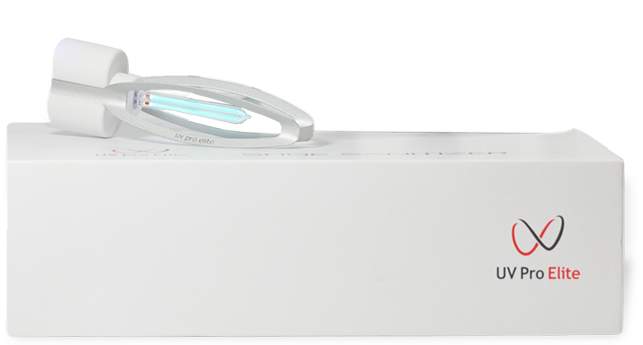 The UV Pro Elite is a one of a kind sanitizer that utilizes wireless, rechargeable UltraViolet (UV) light technology to combat bacteria and fungus that may cause a foul, unpleasant odor in your office, car, home, clothing and other possessions. This product is different from other UV sanitizers because it’s wireless and rechargeable as well as it features a UV-C lamp that produces ozone, which helps to completely disinfect areas where the UV light cannot reach. It was a very good buy at this price. UVPRO has separate modes and makes it more easy to use with several things that I have without buying extra devices for each size. It is also very useful while you travel I wish it came with a travel pouch otherwise very pleased with this purchase. This is my second purchase and it is for my wife. One day after trying my device, she asked… “Why in the heck did you give me the crappy one?”… I love my UVPRO, it has yet to fail me ever. I do a lot of travels. It has plenty of features that are really useful.